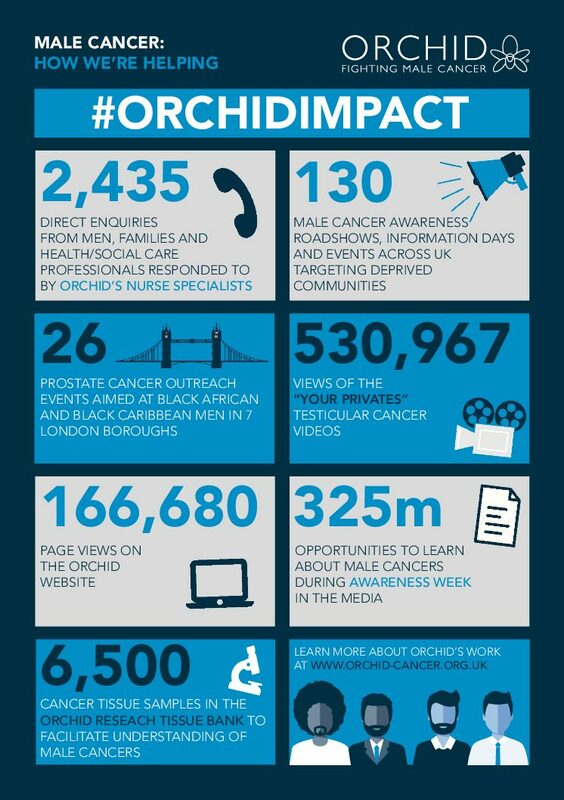 On International Men’s Day we reflect on the challenge facing male cancers and the role that Orchid plays in helping to raise awareness of male cancers, provide support to men and their families and support research into finding better diagnosis and treatment options. Each and every year around 50,000 men will be diagnosed with a male specific cancer – prostate, penile and testicular cancer. Male cancer, collectively, affects men of all ages, all ethnicities and of all backgrounds. Male cancers claim the lives of thousands of men each and every year. But we can do something about this. Orchid exists to save men’s lives from testicular, prostate and penile cancers through pioneering research and promoting awareness. We undertake national media campaigns, fund research, educate nurses and healthcare professionals, directly support men and their families and friends through our nursing service, run business and community outreach programmes, provide schools with cancer education resources and produce detailed information resources on each cancer for men who are undergoing treatment – and that is just for starters.